Virginia Dean wakes at midnight beside a dead body, with a bloody knife in her hand and no memory of the evening's events. Dark energy, emanating from the mirrors lining the room, overpowers her senses. With no apparent way in or out, she is rescued by a man she has met only once before, but won't soon forget. Owen Sweetwater inherited his family's talent for hunting the psychical monsters who prey on London's women and children, and his investigation into the deaths of two glass-readers has led him here. The high-society types of the exclusive Arcane Society would consider Virginia an illusionist, a charlatan, even a criminal, but Owen knows better. Virginia's powers are real-and they just might be the key to solving this challenging case. 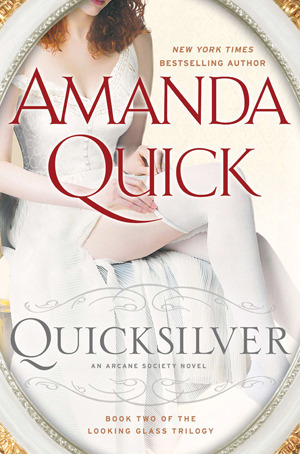 Quicksilver was a very quick read, with the same Amanda Quick formula that I love to love. Owen Sweetwater and Virginia Dean are good people with a penchant for hunting monsters. Side characters are great and readily likable. The action and suspense is exciting. And the romance is sweet and steamy in all the right places. I'm always intrigued by the new psychic spectrum energies that get introduced with each next book of the Arcane Society, and the truth is, I DO prefer this Looking Glass sub-trilogy more than I do the Dreamlight sub-trilogy--for one thing, this one doesn't require employing the same story line in three different time periods, unlike Dreamlight. The contemporary time period introduced some important players and names to recognize when we jump to the Victorian era, but then we are also given even more information, and a more in depth look at how glass light is employed. I think it's and interesting concept. The Quicksilver Mirror comes into play, and even though we don't get to actually meet or learn more about Mrs. Bridewell, the woman who created some dangerous clockwork curiosities infused with psychic energy, used as weapons, we get to actually meet her as well. I would have liked for Millicent Bridewell to have had a bigger role in this book, but you take what you can get. While Amanda Quick books are never entirely memorable, they are certainly always enjoyable. As I've said, I did love the characters. So, Quicksilver, was pretty much just another lovely installation to this ongoing series, and I look forward to the futuristic portion of the story arc.